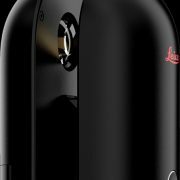 Las Vegas, November 16th, 2016, Leica Geosystems announced the BLK360, a revolutionary miniaturized black 3D imaging laser scanner. The product was revealed at Autodesk University 2016 and will be bundled with Autodesk’s ReCap 360 Pro and the new ReCap 360 Pro app for iPad. Both companies will demonstrate the product for the duration of the conference at the ReCap booth #2033 and the Leica Geosystems booth #1537. The BLK360 captures the world around you with full-color panoramic images overlaid on a high accuracy point cloud. The one-button Leica BLK360 is not only the smallest and lightest of its kind, but also offers a simple user experience. Anyone who can operate an iPad can now capture the world around them with high resolution 3D panoramic images. The Leica BLK360 defines a new category: the imaging laser scanner. It is so small and light that it fits in a typical messenger bag and can be carried almost anywhere. It features a 60 meter measurement range for full dome scans. A complete full-dome laser scan, 3D panoramic image capture and transfer to the iPad Pro takes only 3 minutes. Using the ReCap Pro 360 mobile app, the BLK360 streams image and point cloud data to iPad. The app filters and registers scan data in real-time. After capture, ReCap 360 Pro enables for point cloud data transfer to a number of CAD, BIM, VR and AR applications. 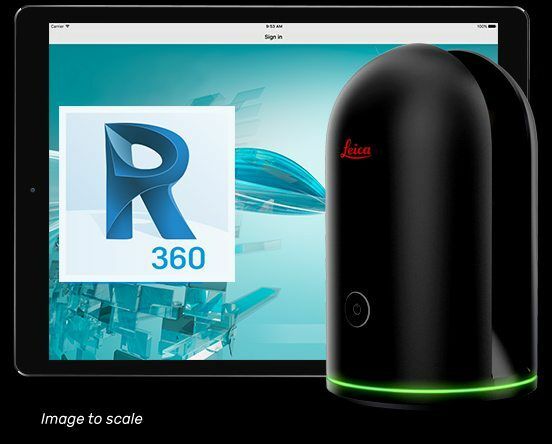 The integration of BLK360 and Autodesk software will dramatically streamline the reality capture process thereby opening this technology to non-surveying individuals. BLK360 & Autodesk ReCap 360 Pro Bundle will be available to order in March 2017. The anticipated bundle suggested retail price is $15,990/€15,000, which includes: BLK360 Scanner, Case, Battery, Charger and an annual subscription to ReCap 360 Pro. For customers who want to secure their spot in line to receive the first batch of BLK360 laser scanners, Autodesk and Leica Geosystems are offering a special limited promotion for a discounted three-year ReCap 360 Pro subscription with a voucher giving priority access to buy the BLK360. Go to this link to learn more. Revolutionizing the world of measurement and survey for nearly 200 years, Leica Geosystems creates complete solutions for professionals across the planet. Known for premium products and innovative solution development, professionals in a diverse mix of industries, such as aerospace and defense, safety and security, construction, and manufacturing, trust Leica Geosystems for all their geospatial needs. With precise and accurate instruments, sophisticated software, and trusted services, Leica Geosystems delivers value every day to those shaping the future of our world. Leica Geosystems is part of Hexagon (Nasdaq Stockholm: HEXA B; hexagon.com), a leading global provider of information technologies that drive quality and productivity improvements across geospatial and industrial enterprise applications. Autodesk, the Autodesk logo, Autodesk ReCap 360, and Autodesk ReCap 360 Pro are registered trademarks or trademarks of Autodesk, Inc., and/or its subsidiaries and/or affiliates in the USA and/or other countries. All other brand names, product names or trademarks belong to their respective holders. Autodesk reserves the right to alter product and services offerings, and specifications and pricing at any time without notice, and is not responsible for typographical or graphical errors that may appear in this document. Led by VFX supervisor Everett Burrell, Zoic Studios delivers big Hollywood explosions and high impact antics to amplify the humor of the film’s chance encounters and secret missions. VANCOUVER, B.C. — Zoic Studios blasts mellow neighborhood envy to espionage proportions in the new action-adventure comedy Keeping Up with the Joneses from 20th Century Fox. The film follows an ordinary suburban couple (Zach Galifianakis, Isla Fisher) who finds it’s not easy keeping up with the Joneses (Jon Hamm, Gal Gadot), their impossibly gorgeous and ultra-sophisticated neighbors — especially when they discover that Mr. and Mrs. “Jones” are covert operatives. The Zoic team, led by VFX Supervisor Everett Burrell, delivered big Hollywood explosions and high impact antics to amplify the humor of the film’s chance encounters and secret missions. The film was released in theaters nationwide on October 21, 2016.Burrell worked closely with Special Effects Supervisor Michael Lantieri while on set in Atlanta, GA, to properly sync all practical effects for the augmentation executed in post-production. One heavy-hitting scene called for a fiery demolition of the Joneses’ house. The Zoic team collaborated with director Greg Mottola (Superbad, Paul) to bring his vision of an ‘80s movie-style detonation to reality. They intensified the larger-than-life eruption to leave audiences with no question of complete destruction, all while maintaining a photo-real look. Since an actual location was being utilized in lieu of a soundstage, none of the mansion blaze was captured practically, requiring the entire sequence to be created in CG. Another scene called for Fisher and Galifianakis to spark a living room fire in a fantasy setting during a romantic moment gone wrong. The living room set was built twice, enabling the crew to practically ignite certain set elements and have Zoic Studios composite the flaming pieces into the scene in post-production. While some practical stunt work called for VFX to bolster the action, certain moments required more comedy chops, including a scene where Galifianakis attempts a Hollywood-style jump through a glass window, only to bounce off the glass upon contact. To practically capture the moment, a stunt actor handled the brunt of the impact with Galifianakis jumping through an empty window placed in a hallway. The Zoic team seamlessly transitioned between the two performances to create a laughter-inducing moment for all. Another sequence entailed creating the look of a 24-story vantage point from what was actually a 5-story perspective at a hotel. To implement this, the team placed a green screen on the floors between the pool, adding scale to the shots in CG to make the pool look significantly lower to the ground. Additional effects work included cleaning up shots to accelerate the action scenes, from practical stunts like removing rigs to muzzle flashes and bullet hits. The team also crafted a CG snake for a comical reptilian dining sequence between Hamm and Galifianakis. 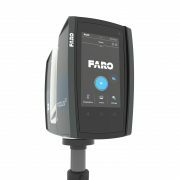 LAKE MARY, Fla., Oct. 10, 2016 /PRNewswire/ — FARO® (NASDAQ: FARO), the world’s most trusted source for 3D measurement and imaging solutions for factory metrology, product design, construction BIM/CIM, public safety forensics and 3D solutions and services applications, announces the release of the all-new FARO FocusS Laser Scanner. The FocusS is the newest member of FARO’s popular Focus Laser Scanner product line and is available in both 150m and 350m ranges. Designed for construction BIM-CIM and public safety forensics applications, this new line of laser scanners brings together several customer-centric features such as an increased measurement range, Ingress Protection (IP) Rating of 54 for use in high particulate and wet weather conditions, an accessory bay for custom add-on devices and a built-in field compensation routine for ensuring system accuracy at all times. “Establishing a new benchmark against the highly successful Focus3D models of the past 5 years, FARO’s Research & Development Team continues to set a high standard for laser scanners. Equipped with highly advanced features in an ergonomic and durable design, the FocusS 150 and 350 are packed with today’s most innovative features to maximize efficiencies for laser scanning professionals,” stated Joe Arezone, Chief Commercial Officer of FARO. With a sealed design, the FocusS laser scanner is certified to a Class 54 IP rating, featuring safeguards against intrusions such as dirt, dust, fog and rain as well as other outdoor elements which can occur in extreme scanning conditions. To ensure confidence in accuracy, the on-site compensation feature enables users to verify the accuracy of the FocusS before each project on-site. Users can correct deviations caused during transport, carrier mishandling or incidental contact automatically on-site and a comprehensive accuracy document can be provided for each scan project. With the integrated accessory bay, additional accessories can easily be connected to the scanner. Customers and third party developers can augment their scanning capabilities by utilizing this accessory port for future technological customization. “Customers who have field tested our new laser scanners are truly excited about the overall capabilities, quality and affordability of the units which are unique to the market,” stated Andreas Gerster, Vice President of Construction BIM-CIM & Product Design at FARO. This press release contains forward-looking statements within the meaning of the Private Securities Litigation Reform Act of 1995 that are subject to risks and uncertainties, such as statements about demand for and customer acceptance of FARO’s products, and FARO’s product development and product launches. Statements that are not historical facts or that describe the Company’s plans, objectives, projections, expectations, assumptions, strategies, or goals are forward-looking statements. In addition, words such as “is,” “will” and similar expressions or discussions of FARO’s plans or other intentions identify forward-looking statements. Forward-looking statements are not guarantees of future performance and are subject to various known and unknown risks, uncertainties, and other factors that may cause actual results, performances, or achievements to differ materially from future results, performances, or achievements expressed or implied by such forward-looking statements. Consequently, undue reliance should not be placed on these forward-looking statements. other risks detailed in Part I, Item 1A. Risk Factors in the Company’s Annual Report on Form 10-K for the year ended December 31, 2015. Forward-looking statements in this release represent the Company’s judgment as of the date of this release. The Company undertakes no obligation to update publicly any forward-looking statements, whether as a result of new information, future events, or otherwise, unless otherwise required by law. FARO is the world’s most trusted source for 3D measurement, imaging and realization technology. The Company develops and markets computer-aided measurement and imaging devices and software. Technology from FARO permits high-precision 3D measurement, imaging and comparison of parts and complex structures within production and quality assurance processes. The devices are used for inspecting components and assemblies, rapid prototyping, documenting large volume spaces or structures in 3D, surveying and construction, as well as for investigation and reconstruction of accident sites or crime scenes. FARO’s global headquarters are located in Lake Mary, Florida. The Company also has a technology center and manufacturing facility consisting of approximately 90,400 square feet located in Exton, Pennsylvania containing research and development, manufacturing and service operations of its FARO Laser Tracker™ and FARO Cobalt Array Imager product lines. The Company’s European regional headquarters is located in Stuttgart, Germany and its Asia Pacific regional headquarters is located in Singapore. FARO has other offices in the United States, Canada, Mexico, Brazil, Germany, the United Kingdom, France, Spain, Italy, Poland, Turkey, the Netherlands, Switzerland, India, China, Malaysia, Vietnam, Thailand, South Korea, and Japan. MORGAN HILL, Calif.–(BUSINESS WIRE)–Velodyne LiDAR Inc., the recognized global leader in Light, Detection and Ranging (LiDAR) technology, today unveiled its new Puck Hi-Res™ sensor, a version of the company’s groundbreaking LiDAR Puck that provides higher resolution in captured 3D images, which allows objects to be identified at greater distances. Puck Hi-Res is the third new LiDAR sensor released by the company this year, joining the standard VLP-16 Puck™ and the Puck LITE™. Expanding on Velodyne LiDAR’s groundbreaking VLP-16 Puck, a 16-channel, real-time 3D LiDAR sensor that weighs just 830 grams, Puck Hi-Res is used in applications that require greater resolution in the captured 3D image. Puck Hi-Res retains the VLP-16 Puck’s 360° horizontal field-of-view (FoV) and 100-meter range, but delivers a 20° vertical FoV for a tighter channel distribution – 1.33° between channels instead of 2.00° – to deliver greater details in the 3D image at longer ranges. This will enable the host system to not only detect, but also better discern, objects at these greater distances. Velodyne LiDAR is now accepting orders for Puck Hi-Res, with a lead-time of approximately eight weeks. Founded in 1983 by David S. Hall, Velodyne Acoustics Inc. first disrupted the premium audio market through Hall’s patented invention of virtually distortion-less, servo-driven subwoofers. Hall subsequently leveraged his knowledge of robotics and 3D visualization systems to invent ground breaking sensor technology for self-driving cars and 3D mapping, introducing the HDL-64 Solid-State Hybrid LiDAR sensor in 2005. 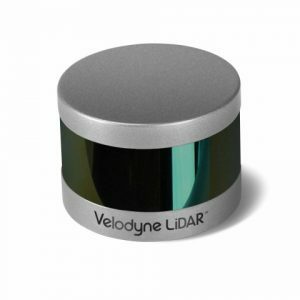 Since then, Velodyne LiDAR has emerged as the leading supplier of solid-state hybrid LiDAR sensor technology used in a variety of commercial applications including advanced automotive safety systems, autonomous driving, 3D mobile mapping, 3D aerial mapping and security. The compact, lightweight HDL-32E sensor is available for applications including UAVs, while the VLP-16 LiDAR Puck is a 16-channel LiDAR sensor that is both substantially smaller and dramatically less expensive than previous generation sensors. To read more about the technology, including white papers, visit http://www.velodynelidar.com. NEW YORK, June 30, 2016 /PRNewswire/ — Hennessy, the world’s #1 Cognac, today announced “Harmony. Mastered from Chaos.” –a dynamic new campaign that brings to life the multitude of complex variables that are artfully and expertly mastered by human touch to create the brand’s most harmonious blend, V.S.O.P Privilège. Set to launch June 30th, the campaign showcases the absolute mastery exuded at every stage of crafting this blend. This first campaign in over ten years also offers a glimpse into the inner workings of Hennessy’s mysterious Comité de Dégustation (Tasting Committee)—perhaps the ideal example of Hennessy’s mastery—that crafts the same rich, high quality liquid year over year. Narrated by Leslie Odom, Jr., the campaign features 60, 30 and 15 second digital spots and an interactive digital experience, adding another vivid chapter to the brand’s “Never stop. Never settle.” platform. The “Harmony. Mastered from Chaos.” campaign showcases the numerous, complex variables that are mastered in order to create the harmony and balance of Hennessy V.S.O.P Privilège. Hennessy’s Tasting Committee oversees the numerous, complex variables that are mastered in order to create the harmony and balance of Hennessy V.S.O.P Privilège in new “Harmony. Mastered from Chaos.” campaign. Hennessy’s Comité de Dégustation is a group of seven masters, including seventh generation Master Blender, Yann Fillioux, unparalleled in the world of Cognac. These architects of time oversee the eaux-de-vie to ensure that every bottle of V.S.O.P Privilège is perfectly balanced despite the many intricate variables present during creation of the Cognac. From daily tastings at exactly 11am in the Grand Bureau (whose doors never open to the public) to annual tastings of the entire library of Hennessy eaux-de-vie (one of the largest and oldest in the world), this august body meticulously safeguards the future of Hennessy, its continuity and legacy. Through a perfectly orchestrated phalanx marked by an abundance of tradition, caring and human touch, V.S.O.P Privilège is created as a complete and harmonious blend: the definitive expression of a perfectly balanced Cognac. Based on a selection of firmly structured eaux-de-vie, aged largely in partially used barrels in order to take on subtle levels of oak tannins, this highly characterful Cognac reveals balanced aromas of fresh vanilla, cinnamon and toasty notes, all coming together with a seamless perfection. In partnership with Droga5, the film and interactive experience were directed by Ben Tricklebank of Tool of North America, and Active Theory, a Los Angeles-based interactive studio. From the vineyards in Cognac, France, to the distillery and Cognac cellars, viewers are taken on a powerful and modern cinematic journey to experience the scrupulous process of crafting Hennessy VSOP Privilège. The multidimensional campaign uses a combination of live-action footage and technology, including 3D lidar scanning, depth capture provided by SCANable, and binaural recording to visualize the juxtaposition of complexity versus mastery that is critical to the Hennessy V.S.O.P Privilège Cognac-making process. “Harmony. Mastered from Chaos.” will be supported by a fully integrated marketing campaign including consumer events, retail tastings, social and PR initiatives. Consumers will be able to further engage with the brand through the first annual “Cognac Classics Week” hosted by Liquor.com, taking place July 11-18 to demonstrate the harmony that V.S.O.P Privilège adds to classic cocktails. Kicking off on Bastille Day in a nod to Hennessy’s French heritage, mixologists across New York City, Chicago, and Los Angeles will offer new twists on classics such as the French 75, Sidecar, and Sazerac, all crafted with the perfectly balanced V.S.O.P Privilège. For more information on Cognac Classics Week, including a list of participating bars and upcoming events, visitwww.Liquor.com/TBD and follow the hashtag #CognacClassicsWeek. To learn more about “Harmony. Mastered from Chaos.” visit Hennessy.com or Facebook.com/Hennessy. In 2015, the Maison Hennessy celebrated 250 years of an exceptional adventure that has lasted for seven generations and spanned five continents. It began in the French region of Cognac, the seat from which the Maison has constantly passed down the best the land has to give, from one generation to the next. In particular, such longevity is thanks to those people, past and present, who have ensured Hennessy’s success both locally and around the world. Hennessy’s success and longevity are also the result of the values the Maison has upheld since its creation: unique savoir-faire, a constant quest for innovation, and an unwavering commitment to Creation, Excellence, Legacy, and Sustainable Development. Today, these qualities are the hallmark of a House – a crown jewel in the LVMH Group – that crafts the most iconic, prestigious Cognacs in the world. Hennessy is imported and distributed in the U.S. by Moët Hennessy USA. Hennessy distills, ages and blends spanning a full range: Hennessy V.S, Hennessy Black, V.S.O.P Privilège, X.O, Paradis, Paradis Impérial and Richard Hennessy. 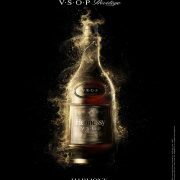 For more information and where to purchase/ engrave, please visit Hennessy.com. Today, Chaos Group announces a new scanning technology that can produce an exact digital replica of a physical material with sub-mm precision. 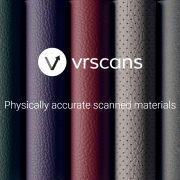 Design and manufacturing firms can instantly take advantage of this patented technology through VRscans, Chaos Group’s new full-service material scanning business. “We’ve dedicated the last 19 years to advancing rendering technology, so designers can trust what they see on their screen. Now they can match the material sample in their hand with the one in their 3D model,” said Peter Mitev, CEO at Chaos Group. While using digital graphics to prototype projects has been the standard for design firms and Fortune 500 companies for years, the ability to present products with 100% accuracy has not. In the past, approximations were used, forcing artists to spend countless hours getting 90% of the way there. With VRscans, companies can now send in their material samples, trusting that what comes back will be the most accurate representation of a digital material yet. Once processed, the materials are returned with a .vrscan file that arrives ready to render in V-Ray – Chaos Group’s widely-used photorealistic lighting and rendering software. VRscans combines precise optical hardware with proprietary software; the result of several years of research and prototyping. VRscans captures each material’s full appearance, including surface texture, reflectivity, dimensionality, and its unique response to light. This complex data is read by the new VRscans plugin, creating a physically accurate material that can be rendered from any angle and in any lighting condition. VRscans is available now and is compatible with the latest versions of V-Ray for 3ds Max and Maya. Support for additional applications is in development. 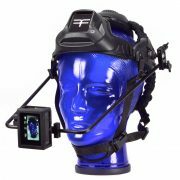 For information and pricing, email vrscans(at)chaosgroup(dot)com or visit http://www.vrscans.com. Chaos Group is a worldwide leader in computer graphics technology that helps artists and designers create photoreal imagery and animation for design, television, and feature films. Chaos Group’s physically based lighting and rendering software V-Ray is used daily by top design studios, architectural firms, advertising agencies, and visual effects companies around the globe. Today, the company’s research and development in cloud rendering, material scanning, and virtual reality is shaping the future of creative storytelling and digital design. Founded in 1997, Chaos Group is privately owned with offices in Sofia, Los Angeles, Baltimore, Seoul, and Tokyo. For more information, visit: chaosgroup.com. 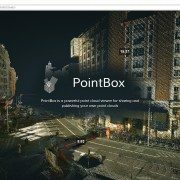 Introducing PointBox, a powerful web-based point cloud viewer for sharing and publishing your own point clouds in LAS, LAZ, PLY, PTS and Potree Zip file formats. For more information or to try it our for yourself, visit www.pointbox.xyz.